The premise of Little Face by Sophie Hannah is an intriguing one that can hardly fail to grip the reader from the start: Alice Fancourt returns from her first outing alone since the birth of her daughter Florence, now two weeks old, and returns to find that the baby in the nursery is not hers. But her husband David seems insistent that nothing is wrong, and the police, faced with no evidence whatsoever that any crime has been committed, are seemingly unable to help her. Is Alice, trapped in a huge house with an increasingly controlling David and his capable but domineering mother Vivienne, really the victim of a cruel plot to swap her baby for another, or is she in the grip of some sort of psychosis brought on by post-natal depression? 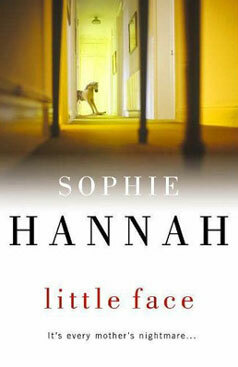 Little Face is a chilling psychological thriller that brilliantly evokes the tense claustrophobia of Alice's situation. Despite its suburban setting of private health clubs, prep schools and alternative health clinics, there are distinctly gothic undertones to the parts of the story that are told from Alice's point of view: Alice is a young woman in obvious danger, trapped in a rambling yet somehow claustrophobic house with a male tormentor and an increasingly ambiguous matriarch, starting to doubt her own sanity at times. As we gradually learn more about David, who is quite clearly not the model husband most people believe him to be, there are moments of real, heart-thumping tension and skin-crawling creepiness that are doubly terrifying simply because they are so horribly believable. However, the narrative is also interwoven with elements of a police procedural crime novel, as well as the personal stories of Charlie Zailer and Simon Waterhouse, the officers in charge of investigating Alice's case, whose complicated relationship is almost worthy of a whole novel in itself. The different gears mesh neatly together like intricately-designed clockwork, making Little Face a satisfying read. It's not easy to discuss the plot of any mystery without giving too much away, but it's sufficient to say that there are plenty of secrets to be uncovered, some harder to predict than others. Sophie Hannah's characters are well-developed and credible, particularly Waterhouse and Zailer, and help to set Little Face apart as something more than just a detective thriller. Some questions about them are left unanswered, but as Little Face is the first in a series of novels in which they feature, this is to be expected, and reading more about them will be far from a chore.